Schematic depiction of the structural differences between the substrate-binding channels of COX-1 and COX-2 that allowed the design of selective inhibitors. The amino acid residues Val434, Arg513, and Val523 form a side pocket in COX-2 that is absent in COX-1. (A) Nonselective inhibitors have access to the binding channels of both isoforms. 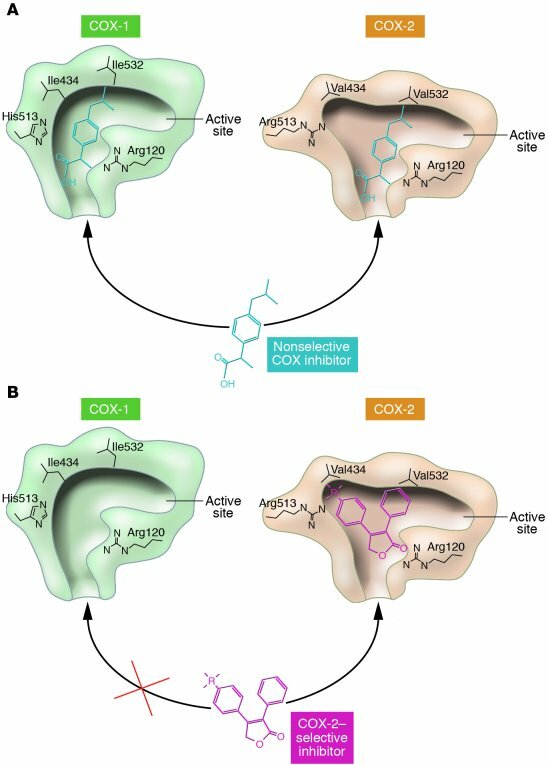 (B) The more voluminous residues in COX-1, Ile434, His513, and Ile532, obstruct access of the bulky side chains of COX-2 inhibitors. Figure modified with permission from Nature from protein structures reported in refs. 18 and 20.